After the sad news of Carrie Fisher's passing, Charles Soule, who is currently writing Star Wars: Poe Dameron, tweeted that he will be retooling a funeral scene in Poe Dameron #14 to honor her. The tweet said: "There’s a funeral in Poe Dameron #14, and Leia’s present – writing that scene today. 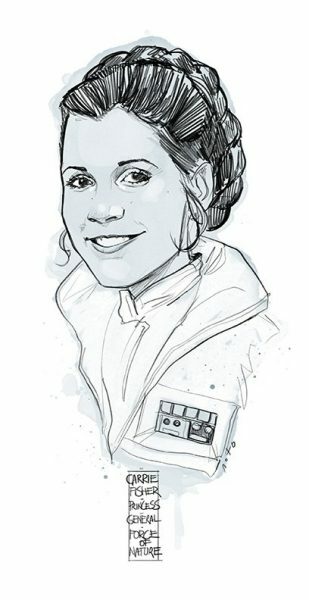 Wasn’t originally about her, but now it will be" The artist of Star Wars: Poe Dameron, Phil Noto, shared his condolences with a new sketch of Princess Leia smiling. He labeled the sketch "Carrie Fisher -Princess - General, Force of Nature". The picture can be seen here: Are you going to pick up Star Wars: Poe Dameron? Do you think we will see more tributes to Carrie Fisher in upcoming Star Wars comic books? Let us know your thoughts in the comments below.